Don’t act like you don’t know what this movie is. Everyone knows this movie in some form or fashion. This is a movie I’ve been watching on a regular basis since I was not but a wee lad. Everything about this flick, down to the acting, the effects, the action, the suspense; everything is perfect. There’s not one bad thing I can say about this work of art at all. So, instead (like most of my articles) I’m just going to praise it up & down, giving you all the reasons why you should watch it. As always, I’m at a loss at where to start, so I’m just going to wing it. The story goes like this. The small town of Perfection, Nevada, is having a little bit of a problem. The problem? Giant subterranean worms are making a meal of the residents, & it’s only a matter of time before Perfection becomes a ghost town. Teaming up to fight the threat looming over…ahem…below them, they use their wits, weapons, & teamwork in a desperate attempt to escape the underground predators or die trying. With a synopsis like that, you know you’re in for a fun film. I don’t want to give too much away in case you haven’t seen the movie (but we all know you have), but I can say that it’s simple yet entertaining. It was written to resemble of the monster films from the 1950’s, & you know what? Once you think about it, it really does feel like a modern ‘50s giant monster movie. You never find out where the monsters come from, & any answers given are purely speculation (though this changes in the sequels). This is very much like those old creature features, & not only is it effective, but it allows much more room for story development since you don’t have to explain every single thing about the creatures. So, long story short, the story is fantastic. A+. Now let’s move on to the characters, & man…are there characters. Obviously, the best place to start is the two main men Valentine McKee (Kevin Bacon) & Earl Bassett. Val & Earl are handymen taking on odd jobs to make a living. After discovering that several of their friends are missing or dead, they begin to suspect something is amiss. So what do they do? Well, first they try to get out of town before discovering that a rock slide has blocked the only road out of town. After that, they use a pair of horses to try & ride their way to a neighboring town to try to get help. On the way, however, they come face to face with what has been plaguing them, & what follows is one of the most tense chase scenes I’ve ever had the pleasure of watching. After these events, Val & Earl pretty much become the leaders of the survivors. Kevin Bacon (Friday the 13th, The Following) & Fred Ward (Joe Dirt, Red Team) play off each other like they’ve been best friends their entire lives. It’s a treat every time the both occupy the screen, & makes for some of the best scenes for the movie. But, despite all that, they’re not the best characters in the movie. Oh no…there’s only one person that can take that title. One of my favorite characters of all time, that person is Burt Gummer. Burt Gummer, played by Michael Gross (Family Ties, Blue Eyed Butcher), is a military survivalist complete with the mentality that World War III was inevitable & a basement full of military grade weaponry. The shining moment in this film is when an unfortunate monster makes the mistake of invading the basement/armory while Burt & his wife Heather (played by famous singer Reba McEntire) are still in it. Let’s just say that everything ends with a bang…followed by a barrage of bangs…& a boom. The rest of the cast is very good at portraying the townspeople, each with their own personalities, but these are they three that steal the show. 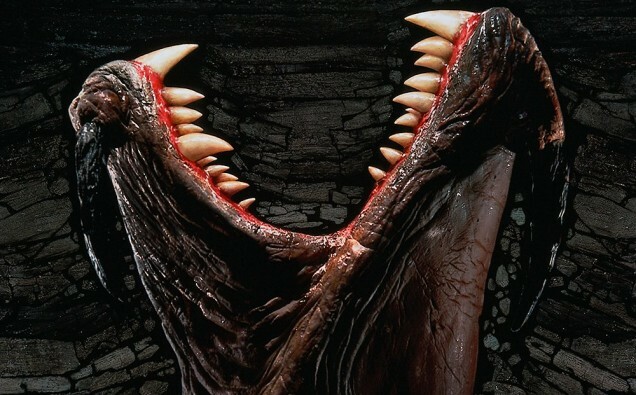 It’s time to talk about the worms, or as their named in the film, “Graboids”. These things are at least 30 feet long, sense their prey by sound (due to being underground & not having eyes), & have at least 3 tendrils that protrude from their mouth. Also, each tendril has its own mouth so it can latch onto tasty things like cattle & people. The design of these creatures is amazing, & completely unique. Everyone knows what these things look like because they are so memorable. The effects used to make these monstrosities come to life look just as great as they did when I first saw the movie as a kid. The move great, the look great, the parts where the eat people are great, they’re just great. What else is there to say? If you haven’t seen them in action, stop whatever you are doing & watch this movie now. Do I really need to repeat myself? Everything about this movie is phenomenal. It does exactly what a movie should do, which is to entertain the people watching it. Everything about it flows perfectly, & it never gets boring no matter how many times I’ve watched it. If you need to watch one movie today, this is the one.